Here are a couple of interesting products that, while they may not cure cancer or other deadly diseases, can help make your life a little easier and possibly more pleasant and secure. One's a nifty hand blender, and the other is a great little Wi-Fi net cam you can use to monitor a variety of situations. The blender from Kenwood (not the audio company) looks like an intimidating ninja device, or maybe a light saber, while Belkin's Netcam HD works as a baby monitor or just as a security camera aimed at where you think your next home invader might be coming from. Kenwood in this instance refers to the manufacturer of kitchen appliances and stuff such as food processors (that reminds me: I once patched my computer into a blender and ended up mincing my words! ), coffee makers, blenders and the like. They offered me (and, by osmosis, my wife) a chance to play with their model HB724 (click the image for a slideshow) - one of a variety of such products - so we've been busy in the kitchen trying to exploit its capabilities. And you know what? It's pretty cool! We've had a hand blender for years, a little white thing that's okay for tasks like whipping cream but it splashes stuff all over the place (though not when my wife uses it, for some strange reason) and isn't much good for serious blending. The Kenwood is a far more formidable machine, however, and comes with oodles of attachments to make it even more flexible. A couple of things that make the 724 compelling are its 380 watt motor and the patented three blade system. The unit also has a "unique foot design to chop and blend ingredients as efficiently as possible," according to the company. According to Kenwood's website, the Triblade system provides "optimized performance for super fast and efficient blending. The blades sweep through three different paths providing three levels of cutting per rotation, while also combining with the integral flow management ribs and apertures which together with the blades make up the unique Triblade system." And a partridge in a pear tree! That power and those three blades certainly do whip (or whatever) up a storm! The blender also features a stainless steel wand and comes with its own beaker, whisk, chopper and puree masher attachment. There's also an attachment - they call it the "Soup XL pan blender" - that's designed specifically for (you guessed it!) blending soups right into the saucepan you plan to use, and the splashback factor is rewardingly low even for a complete klutz like me. It also has its own "triblade foot" that has its own stainless steel blades and ribs. We haven't had a chance to try all of its ins and outs yet, but so far we've been really enjoying the Kenwood. My wife loves it for the way it makes creating mashed potatoes not only easy but with excellent results, and I'm kind of partial to how well it crushes ice for when you're having a Margarita emergency. I guess you could say the device is so flexible you can use it "tequila" few birds with one stone, er, appliance. We had a heckuva time getting the top off one of the attachments, the 16 ounce chopper with rubberized base and lid. My wife and I tried everything including cussing (you should have heard her! ), but to no avail. It was extremely frustrating. Then my son came over to visit and the rotten SOB had the thing twisted open within about 30 seconds and it has worked fine ever since. We're grateful, but for showing us up so easily he's out of the will. The unit is quite large, at least when compared with our crummy little "reference" hand blender, but it's comfortable in the hand, and it has variable speeds including "turbo" (with no lag!). The blending wand is removable and the parts are said to be dishwasher safe. The list of attachments includes a 24 ounce blending beaker (so you can blend right in the pan, assuming you fit) a dedicated mashing/pureeing attachment, and a balloon whisk you can use for things other than whisking balloons (such as cream, mousses and egg whites). It really is a heckuva machine, and even if you can't get that darn lid off it still does lots of things. We're not the only people to fall under the spell of this hand blender; while I couldn't find any listing for it on Amazon, a British site gave the thing a five star rating (out of five, fortunately!) and purchasers there gushed phrases like "brilliant piece of kitchen equipment," "best potato masher ever," "a must have for the kitchen." And at a suggested retail price of about $129, that seems like a pretty decent investment. Especially if you like Margaritas. Big Brother - YOU! - is watching…. Belkin's Netcam HD (click the image for a slideshow), on the other hand, works in a lot of venues other than kitchens, though it would work fine there, too. It lets you keep an eye on whatever your particular valuable may be, from a sleeping baby to your front yard or garage. And you can monitor it from wherever in the world you have Internet access. How's that for cool? This little camera certainly won't set the world on fire as far as being a reference quality camera is concerned, but it still gives you a quite serviceable 720p HD picture and, thanks to the cam's built in microphone and the app you use with it (I installed it onto my iPad Air but there's an Android version as well), you can also listen for trouble (baby crying, gunfire?) and even take videos in case you might need evidence later (or, to be a little more lighthearted, to capture that ultra cute moment when baby first smiles in his/her/its sleep). Belkin says the camera even has night vision and you can even have it email you if the camera detects movement! Since my babies are old enough to be having babies of their own, my preferred use for the Netcam HD is to perch it inside the bow window in our living room, which looks out over the grounds of Chateau Bray. Depending upon how I aim it, I can have it monitor the street in front of the house, the walkway to the front door, or the front stoop itself. The great thing about this is that I can be downstairs in my home theater and if someone braves the alligators and spikes and actually makes it to the door, I can see who it is without having to actually get up and move my body. Ah, the sedentary life! Now enhanced by Belkin! The Netcam not only works with apps for iOS and Android; a web browser interface is also offered. You can screw the camera's little mount into a wall, or wherever else you may want to mount it permanently. I've been using the mount to merely perch the Netcam HD inside the window, on the shelf below the glass; this gives me the flexibility to move it if I want to, while saving my wife from having to beat up on me for putting screw holes in the base of her favorite window. It works fine that way, too, until a cat or dog bumps into it and I have to re-aim it. But that's an easy process and it gives me an excuse to beat on the dog when my wife isn't looking (it's cute when the cats jiggle it, though). Setting up the app was easy. All I had to do was set the switch on the camera's rear panel to the proper setting, connect my iPad to its Wi-Fi signal, fire up the app, and then let it walk me through the rest. Once that's done, you just put the switch back onto the "camera" setting and you're off to the races. Now, you aren't getting full 60 frames per second video here - Belkin says "up to 25 fps," so the image can be a tad choppy, but it's good enough for a security camera/monitor. Heck, this camera isn't supposed to be for making Hollywood productions; it's a security device. And a pretty neat one at that. 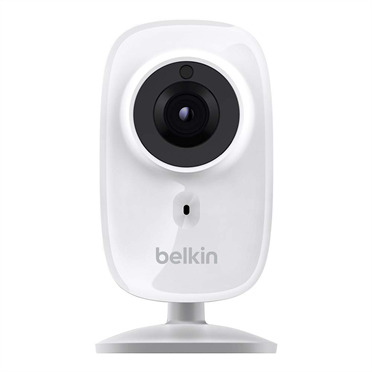 The Netcam sells for $149, but Belkin's website has it listed at the time of this writing at $129.